Economy: Economic indicators can be mixed, but two facts are worth noting. In 2007, prior to the recession, unemployment in Rochester was under 5% - it is under 5% now. And all jobs lost in the recession have been regained. Prior to learning about Rochester, my perception of the region began and ended with snow. If I were forced to provide further description, I might have used the adjectives agricultural and gritty. After researching the area, it became clear that perhaps the best descriptive term would be talented. Unbeknownst to the outside world is the plain and simple fact that Rochester is oozing with talent. Iconic companies, Grammy-winning musicians, Oscar-winning actors, and Smithsonian-recognized artists have long been a part of the community fabric. Creativity and quirkiness are recognized, admired, and fostered. This week, those elements are on full display at the First Niagara Rochester Fringe Festival. This multidisciplinary visual and performing arts extravaganza, which treads the line between quirky and weird, is now one of the best-attended fringe festivals in the country. Rochester has a very strong sense of community. Along with this sense of unity comes a heightened awareness of local events. Potentially positive news is met with significant enthusiasm (or healthy skepticism), and negative news always seems to hit very close to home. Undoubtedly, Rochester has its share of tragic stories, with young men killing other young men on a regular basis. The frequency of these brutal acts has given native Rochesterians a sense that they live on a markedly dangerous plot of Earth. Yet as a transplant who has lived in or near Hartford, CT; New Haven, CT; St. Louis, MO; and The Bronx, Rochester seems remarkably safe. What do the statistics actually show? 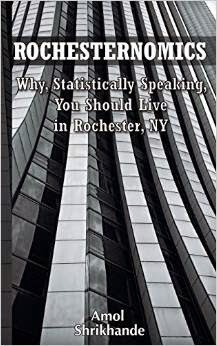 According to one ranking, among the 100 largest metropolitan statistical areas in the country, the Rochester MSA has the 19th lowest crime index. A list of the 30 American cities with the highest murder rates does not include Rochester. The only city in New York State is Poughkeepsie. Among America's 100 most dangerous cities, Rochester ranks 75. St. Louis is #14, New Haven #36, and Hartford #45. Beloved Atlanta, Washington D.C., Miami, and Philadelphia are all more dangerous than Rochester. In the context of Rochester's recent spike in violent crime, I recently overheard a conversation regarding leaving the area to escape the lawlessness. Interestingly, this rise in violent crime has occurred all over the country. Which, of course, makes me ask: where are you going to move? If you have even a remote interest in American history, Rochester is extremely rich in this regard. Rochesterians don't need to read about history to appreciate it. We essentially live history on a daily basis. The rise, fall, and rebirth of the past 150 years is on display...all the time. New riverfront apartments give way to an abandoned subway. A downtown housing revival occurs under the watch of a revolving restaurant that no longer revolves and isn't a restaurant. Trendy eateries and breweries line a transportation corridor that is definitely not trendy...the Erie Canal. Roads which became highways become roads again. And new companies utilize the infrastructure of iconic companies which barely resemble their former selves. Do you enjoy being around engaged, intelligent individuals but wish they didn't think they were so important? Rochester has an uncanny ability to produce smart people who are also down-to-earth. Couple a local culture that values education with Rochester's tendency toward self-deprecation, and the result is pretty nice. While historical job loss receives immense attention, those who can find a job that suits their taste live the good life. Take a satisfying job and add (a) top-tier cultural and educational outlets, (b) really affordable housing, (c) really short commutes, and (d) a lot to do. That's a solid formula for contentedness. There is nothing like a patchy city when it comes to exploration. If willing to leave one's comfort zone even a little bit, the number of surprising finds can be astounding. While the external facade of certain places is uninviting, the warmth, thoughtfulness, and creativity inside are what give Rochester its undeniable quirkiness. Everyone loves the underdog, and everyone loves a good comeback. Rudy, Hoosiers, March Madness, and the 2004 Red Sox capture our imagination for a reason. In Rochester, we're definitely an underdog, and we're definitely making a comeback. For those of us who realize it, the energy is palpable. As shown in the last post, Rochester is pretty respectable when it comes to walkability. One can argue that we should have more destinations to walk to, but that argument doesn't alter the fact that the city layout is inherently walkable. Furthermore, a closer look at more walkable cities highlights a very important point: they are really expensive. Some of the most walkable cities as per Walk Score include New York City, San Francisco, Boston, Miami, Washington D.C., and Seattle.